There’s many reasons we move home, why we relocate from one place to another just as they’re no doubt many reasons why you’re moving from London to Salford. It could be because of work or family or it may be because you simply want to start afresh in a new part of the country. Regardless of your specific reason for moving to Salford, you should move to Salford with our removal company. We have helped countless people relocate from London and our list of satisfied customers and excellent reputation is because they have told others we deliver on our promises. Added to our very low prices, you should give us a call before anyone else. Give Moving Service a phone ring now in fact on 020 8746 4402 and we’ll give you a free personalised, quote. Every aspect of our removal company is of the highest standard. Our man with a van service for instance could be all you need for your relocation to Salford. That’s because every one of our dedicated removal personnel are not only knowledgeable, courteous and professional but willing to help you in any way possible to make your home move to Salford as smooth as possible. Likewise, if it’s an office relocation or business relocation to Salford, our removals firm gives you everything you want whilst keeping the price you pay the lowest around. Our man with a van to Salford or larger removal team will ease your worries from the moment you hire us. We do this by always being available for you so anytime you come up against a problem and need a solution fast, you know where to turn. Which means you moving house to Salford is just that little bit easier. Salford is a fast developing city in Greater Manchester with a population of approximately 73,000. During the 18th and 19th centuries, it’s been a major factory town and inland port, home to many cotton and silk mills as well as Salford Docks. 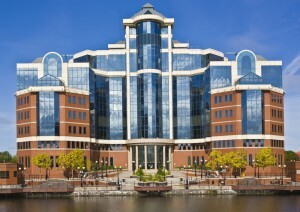 In recent years, Salford has gone through some major redevelopments and regeneration. An example of this is MediaCityUK situated on the banks on the Manchester Ship Canal. It’s home to a number of prominent media companies. 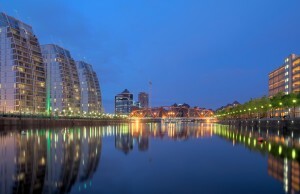 Salford’s central location as well as its shopping and leisure facilities have seen it become an ever more popular place to live and work in recent years. So if you’re moving house to Salford and you’re looking for a house removals company who have lots of different services then get in touch with us. In addition to services like man and van hire we have a packing and unpacking service available for you. Which means you can relax whilst our expert packers professionally pack away as many or as few items as you wish for your home move to Salford. We also have a vast range of packing accessories which means you’ll never be lost for those little removal essentials to make moving home or business to Salford that little bit more straightforward. We recommend our expert removal firm because if you take a chance with a less professional removal company elsewhere you may end up regretting it. That’s why the sooner you hire our removals firm, the sooner you know that you have a reliable, professional and trustworthy removal service to transport your household contents safely to Salford. So ring Moving Service now on the phone number 020 8746 4402 and tell us how we can make moving from London to Salford a better experience and we’ll tell you in return how we can make it a cheaper experience as well.